Our Mountain Hardwear Skyledge tent is almost dead in Kyrgyzstan. 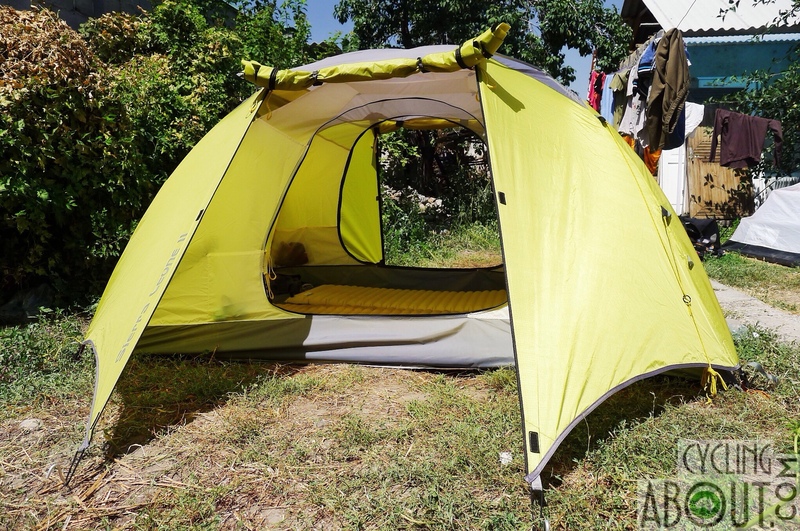 It is still waterproof, but the inner isn't clipping onto the poles and we don't seem to be getting anywhere with Mountain Hardwear's pathetic customer service… so we went shopping in Bishkek! 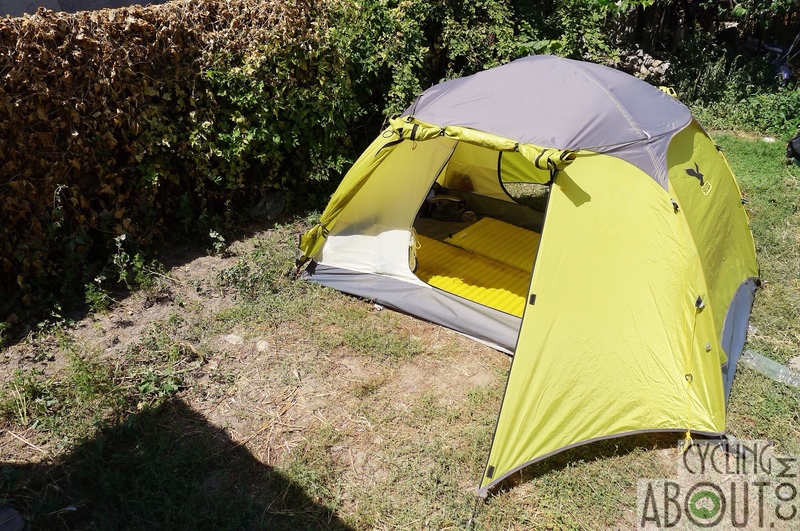 We found out that Italian outdoor brand Salewa was available, and after checking out the tent specs we decided to set one up at Sport Expert Outdoor Store. The three possible tent options were all in stock, however we found the Micra II too small and the Denali II had a few dumb design features. The Salewa tents all seem about 0.5kg heavier than they could be, but hey, we're in Bishkek and can't afford to be picky! We ended up purchasing the Sierra Leone, a 3-4 season, 2-3 person tent. – 10000mm PU laminated floor and 5000mm rain fly. 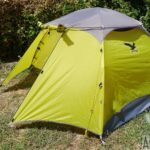 The materials used in the Salewa tent seem to be top notch and are the main reason this tent is so much heavier than our lightweight Mountain Hardwear. – Inner entrances. Really big doors with convertible mesh windows that can be closed to keep warmth in on cold nights. – Outer entrances. The double zip design and small porch makes the vestibule space quite useful and really easy to get in and out. We look forward to cooking in the side of our tent! – Number of clips. The number of clips from the inner to the poles is four more than our old tent, spreading the load over more clips. The clips also connect loosely on the poles meaning they can slide up and down, adjusting themselves when need be. – Ventilation holes. 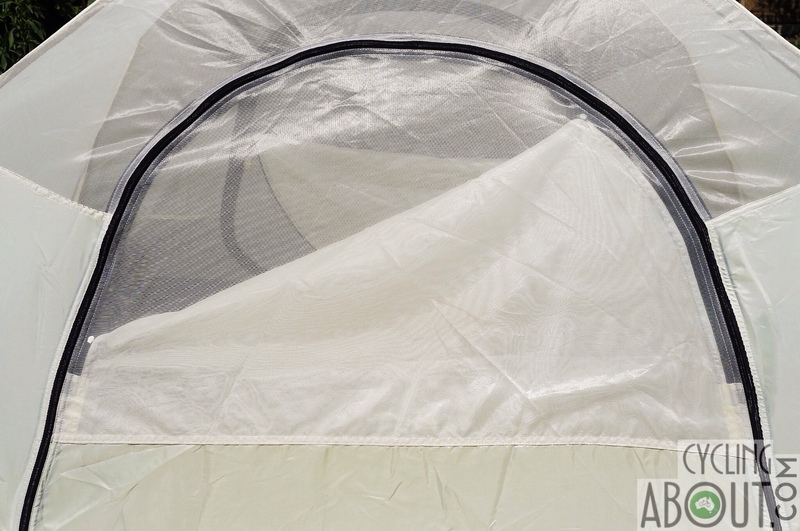 Two ventilation holes on either side of the tent allow better ventilation and will hopefully reduce condensation on cold nights. – Length and Size. Being two metres tall, the length is always important for me. 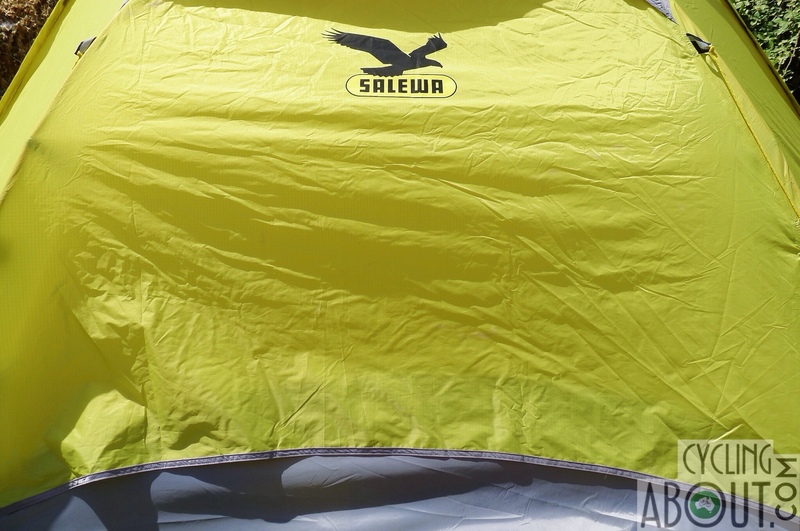 The Salewa tent comes at a rather lengthy 235cm. This two person tent is really roomy inside too; we can fit all of our gear in with us, handy when we setup without the fly. – Guy ropes. The guys connect at two locations which grab the tent poles quite well to secure the tent in strong winds. – Roof storage and deep pockets. There is heaps of internal pockets for us to hide our small bits and pieces. – Pole length. These poles are 40cm long, as opposed to the ~50cm poles on the Mountain Hardwear tent. Although not a big difference, it will be easier to get the poles in and out of our bag! – The pole hole tabs on the fly. On the first night of using the tent, we've already broken a tab off our fly! We're hoping that this is a one off… but we can't be sure. We will be contacting Salewa about this matter and may do some additional stitching on our current fly just to be sure. – The fly resting on the inner. This is our biggest concern as we feel that water or condensation could possibly find itself inside our tent. Time and testing will tell, but we plan to add an additional guy point if this is a problem. – The weight. Although not particularly heavy, we have added over 1300g to our tent weight! 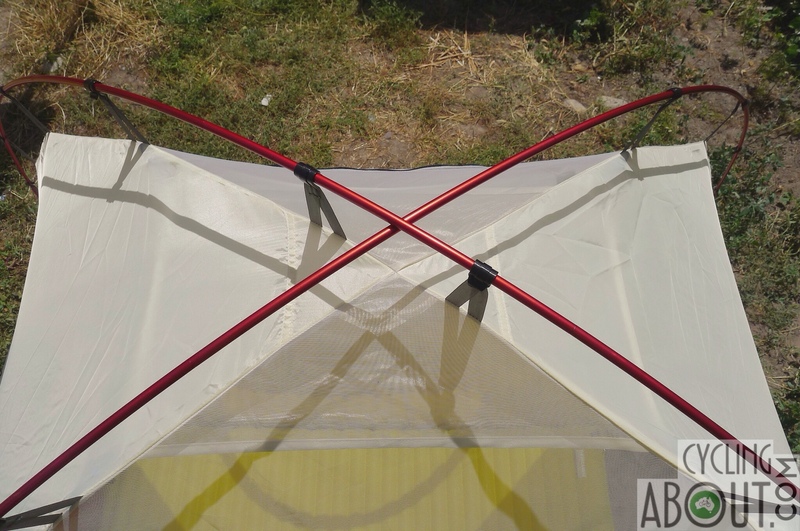 Given the heavier materials and the additional pole, the weight does makes sense. 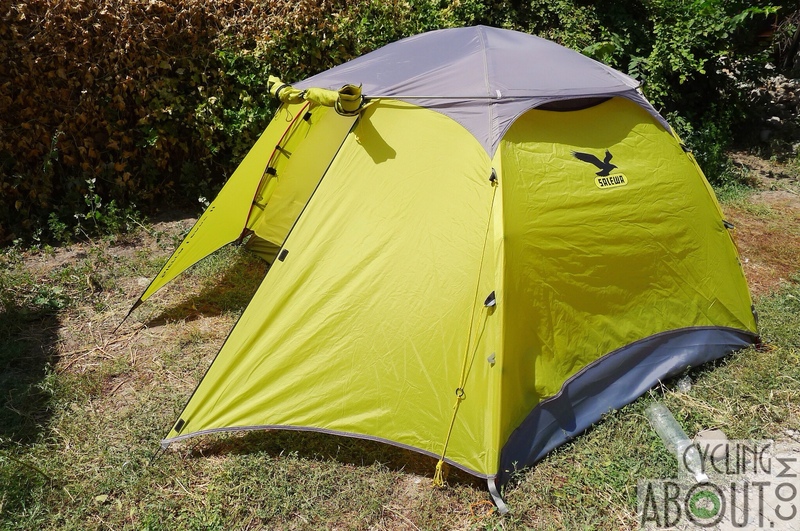 However, for comparison sake, the most comparable tent in our mind is the Mont Fire Fly which shares similar dimensions (albeit one less pole) and is about 600g lighter. – The colour. 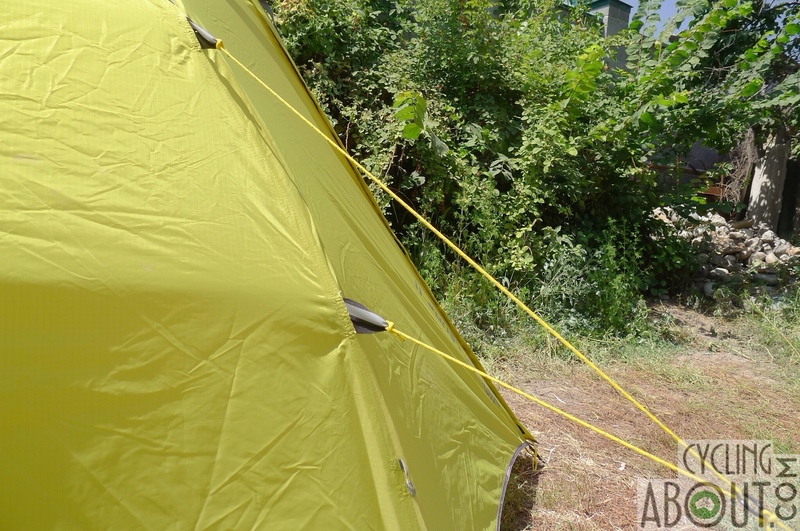 We would prefer either a dark green or a sandy colour tent over the yellow green of the Salewa! 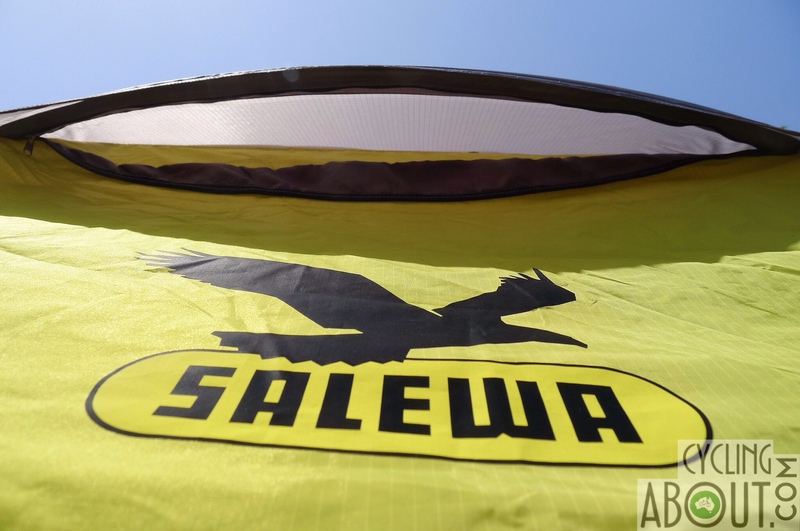 Unfortunately we've returned the Salewa Sierra Leone tent. With the above design fault found on two flys (in one day! ), we can't take another with the faith it won't happen again. 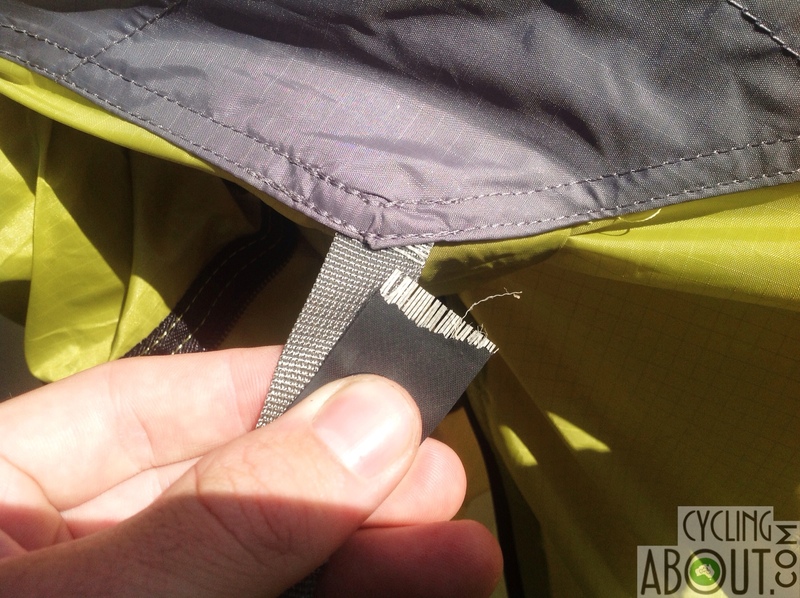 Once Salewa has fixed these tabs (we'll try and get an explanation) and made the fly lift off the inner, the Sierra Leone will be a fantastic tent for the budget minded adventurer.